Veselin Topalov (born March 15, 1975) is a Bulgarian chess grandmaster. In the April 2005 FIDE rating list, he was number three in the world with an Elo rating of 2778. He was born in Ruse, Bulgaria. He was taught the rules of chess when he was eight years old by his father. In 1989 he won the World Under-14 Championship in Aguadilja, Puerto Rico, and in 1990 won the silver medal at the World Under-16 Championship in Singapore. He became a Grandmaster in 1992. Topalov has been leader of the Bulgarian national team since 1994. At the Chess Olympiad in 1994 in Moscow he beat Garry Kasparov (see below), and led the Bulgarians to a fourth-place finish. He has won a number of tournaments, and at the FIDE World Championship in New Delhi in 2000 reached the quarter-finals. 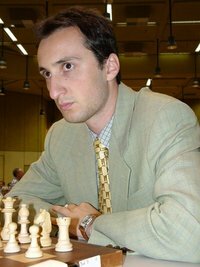 Topalov was also on the receiving end of what Kasparov considered his best ever victory, played at Wijk aan Zee in 1999. This article is based on the article Veselin Topalov from the free encyclopaedia Wikipedia and stands under the GNU-Licence for free documentation. In the Wikipedia a list of the authors is available.